On the web, you find almost any old rubbish that people have collected, both for sale on ebay, and proudly displayed on web pages. Here is no exception. 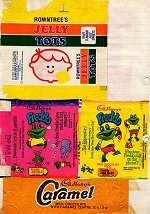 The following pages are a trip down memory lane to everyone with a sweet tooth. So is this really a load of old rubbish? ..... Well, eh... yes. 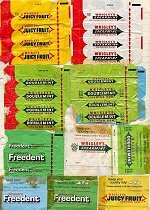 But is it fun to see the old wrappers again that you remember from the 1970's? ..... Without a doubt. 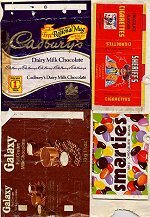 Have many heads been turned by the fact someone still hoards an old sweetie paper collection from the 1970's? .... You bet!! 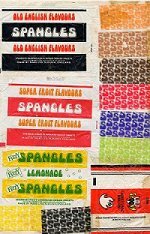 Even an unopened packet of spangles was found in a sealed tin box!! I guess they are somewhat gooey and sticky now. Remember, it is old collections that make up current museum contents. So follow the links for a nostalgic trip back to the 1970's. Once you tire of my own pages here, I have been on another superb nostalgia site that had me browsing and browsing. 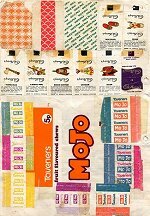 The "DO YOU REMEMBER" site is mainly 70's 80's and 90's nostalgia.